Shelter are now offering individuals the chance to be interviewed and take up a placement in their Dundee offices. The placement delivers low level housing advice, with Shelter putting the selected individual through their training to national housing qualification level. Those successful are embedded within the induction process at Castle Huntly, co-delivering Shelter housing advice sessions and engaging with their peers to address hidden housing issues. This part of the process is now being evidenced as extremely valuable with the uptake increasing each week. The ultimate aim for this partnership was to provide national housing qualifications to an individual in our care who could then both work in the Shelter offices and within the prison as a contact for housing/homeless/debt/tenancy issues, and upon release hopefully be provided with employment opportunities through Shelter or their contacts in the community. 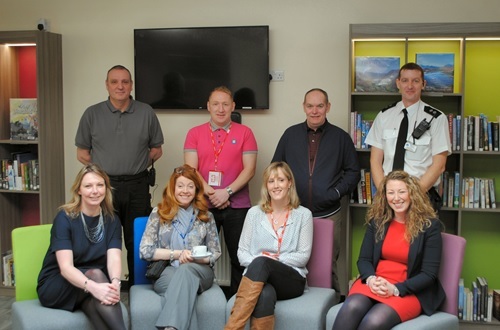 “Our partnership with HMP Castle Huntly shows that addressing the lack of a stable, safe and affordable home on release from prison can have a positive impact on breaking the offending cycle. “When in prison, people often lose their accommodation because of an inability to pay rent whilst serving their sentence or through a family break-up. Many don’t have a job to go back to upon release, making finding and maintaining a home very difficult. It doesn’t need to be this way and with the right advice and support, provided by their peers, ex-offenders can go on to lead successful lives and contribute a great deal to our society.